The macro trend in the population and number of households is toward a decrease in the medium to long term. Even so, both users and service centers are expanding, and there are great expectations for potential consumer demand. This is a series of ten reports on the storage business (rental storage, container storage, and trunk room storage) and self-storage markets in Japan, from a market environment perspective. We often hear about the “declining birth rate and aging population” in newspaper and television news reports. Looking at the actual data in Figure 1-1 below, we can see that there is a trend toward decrease in the population. As of March 31, 2013, the total population in Japan (excluding non-Japanese) was 126,393,679 (down 266,004 from the previous year) (Ministry of Internal Affairs and Communications: Population in the Basic Resident Register). The population began to decrease in 2006 for the first time since the survey began in 1968, and in spite of year-on-year increases in 2008 and 2009, the population has decreased for the fourth consecutive year since 2010. The declining number of births and the increasing number of deaths are thought to be the main causes of this trend. According to the “Population Projections for Japan (January 2012) (based on the 2010 National Census)” conducted by the National Institute of Population and Social Security Research, the total population of Japan peaked in 2012, with 128,060,000, and the median estimate is that it is entering a gradual decline thereafter. The total number of households, however, was 54,594,744 (excluding the households of non-Japanese only) as of March 31, 2013 (up 423,269 from the previous year) (Ministry of Internal Affairs and Communications: Population in the Basic Resident Register). According to the National Institute of Population and Social Security Research, the total number of households will peak in 2020 (at 53,050,000), and it is estimated to gradually decline after that (Figure 1-2). The main factor that increases the number of households in spite of the population decrease is the population per household decreasing—that is, the progression of the nuclear family—with family households in which children and parents live together declining, and an increase in single-dweller households (living alone). Looking at the flipside of the “declining birth rate and aging population” mentioned above, while the population of children (aged under 15) is decreasing, the population of seniors aged 65 and up will continue to increase going forward. In addition, while the distribution ratio of family households in 1990 was 47.8% family household (couples with their children and single parents with their children), in 2010 the number of single-dweller households was higher than households of couples with a child (children), and single-dweller households are expected to exceed family households in 2025. Combining these two trends, we can see that young family households will decrease, and elderly singled-dweller (elderly living alone) households will increase. In these ways, in interpreting the macro economy of Japan as a whole through casual everyday life, we can see that we are approaching a major turning point. How many storage service (rental storage, container storage, and trunk room storage) users are there? So, roughly how many people use storage services? First of all, at this point the total number of available rental storage and container storage spaces is estimated to be about 8,000 locations (including trunk rooms), and 355,000 rooms (the actual spaces used for storage, excluding trunk rooms) (Yano Research Institute). So, taking “1 room = one contract,” and calculating the total number of rooms as the total number of households, we come up with 0.0066 rooms per household—that is, 1 room per 152 households. It depends on the size of district and street, but rough number of users is about one or two households in the neighboring areas. Based on questionnaire surveys carried out independently by our company via the Internet, the ratio of people who have used a storage service was 0.5% to 1.0%, so generally the sense of usage ratio and user volume is consistent. Along with the sharp increase in the number of storage service locations in recent years, there has been a trend toward increase in the number of users, but there is definitely still a lack of awareness about storage service itself. By raising accurate recognition and awareness of storage service, further increases in the number of users can be anticipated. Who uses storage (rental storage, container storage, and trunk room storage) services? Next, let’s consider what kinds of people use storage service. What we find in looking at most operators and questionnaire surveys is that storage service is not being used as a matching service for a group with a certain demand, but rather that it is used by all kinds of people. Users comprise a broad range of ages, with a slight trend toward higher usage among those in their 40s and 50s. We don’t see any particular trends such as low usage among those in their 20s and 30s or among those in their 60s or older. And although we find slightly more men when we look at contract holders, more women actually come to use the storage space. So in simply determining who the contract holders are, we find that for rental storage as well as for containers storage there is a broad range of ordinary people, men and women, young and old, and a variety in the compositions of families who actually use the storage service. In terms of characteristic trends, we can see a difference in the image of the users depending on the location of the facility. At suburban container storage locations, for example, we find more corporate contracts than in urban areas. We assume that these are used as warehouses for things like materials, equipments and tools. 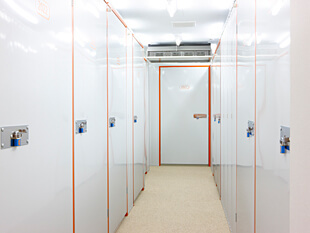 For rental storage, many locations are in the city, and these rental storage spaces are used predominantly by regular consumers, and we assume they are storing mainly household items. Looking at the trends in population and the number of households, it is an unavoidable fact that we are approaching a trend toward decline in the medium to long term. The number of people using storage service is still low, however, and this number could potentially double or triple in the medium to long term. That is why storage service is expected to be a growth market. If, for example, groups of good friends in neighborhoods of five or six households decided to share one storage service room—this would call for ten million storage service contracts. With that alone we could anticipate 30 times the current market. If people come to realize that instead of thinking, “I don’t need that—I have a shed in the garden,” they can use storage service to keep their precious things in an appropriate environment for the long-term, we can anticipate an even greater market. It is still a market of waiting for users. If we can deliver (provide, not physically deliver) storage service to the people in need of storage solutions, however, we will find that it is a market with great potential.